Silk organza layered dress, from Fendi, New Delhi. Rings, bracelets (worn throughout), all Rithika’s own. “Yes, the practice is important, and you have to consistently work hard to make the work that you want to make, but at the end of the day, an artist needs to know how to issue an invoice…and it’s as simple as that.” It is a cool monsoon afternoon in Mumbai and Rithika Merchant and I are chatting over Skype; she is in her Barcelona studio (located quite conveniently inside her apartment — and she very much likes it that way), preparing for a month-long annual trip to Mumbai. Although she has been living in the Spanish city for over seven years now, Mumbai is still home. She lives between the two seaside cities, which keep her close to the water. She is cool and collected, and likes to get straight to the point. I am pleased by her honest approach to our conversation, and what I enjoy most is her pragmatism, and the steady manner in which she answers questions about her life, her work, and her views on the state of the arts today. “We had a class called ‘professional practices’ in college and it was one of the most useful subjects that I ever took — we had writing workshops to help us put together statements and proposals, and practical sessions that took us through the business and financial aspects of being full-time artists,” she continues. Although her work has elements of the romantic and the nostalgic, a chat with her is more precise than meandering — she is at once living the life of an artist in the bohemian city of Barcelona, as well as sharply manoeuvring the field with her practical acumen. In contemporary times, this is what successful artists are able to do. She sees the industry for what it is, and stresses upon the need for artists to educate themselves on administrative and business concerns. 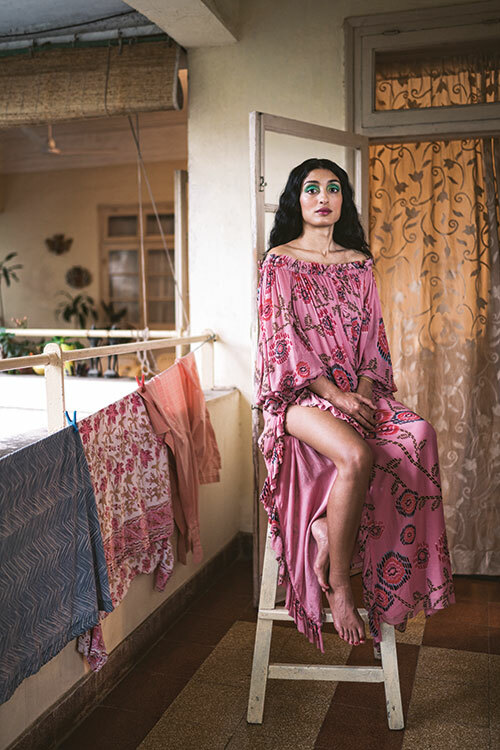 Crêpe tunic, by Urvashi Joneja, New Delhi. Merchant is primarily a painter, and her work is full of vivid imagery. She uses the decorated landscape as a way to negotiate history and mythology, from which she draws influence. Her pieces are quietly reflective, inviting the viewer to spend time with the small details — the result of meticulous planning and attention — and to allow every added element to bring to life a rich tableau. 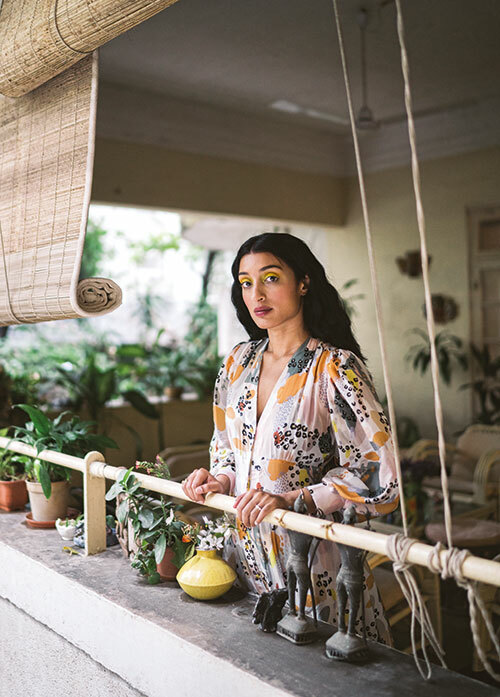 As a young girl, she grew up in Mumbai, nurturing a keen interest in the visual arts. She was close to her grandmother’s sister, as her own grandmother passed away at a young age, and together they would sit in a makeshift ceramic studio – set up on the roof of her great-aunt’s building, next to the elevator motor room – and teach each other ways to work with different clays. The young creator’s favourite activity was to repeatedly ‘squish’ the material, a technique by which water is mixed disproportionately with the clay, resulting in a more elastic and wet medium. She liked the texture this gave the clay, and particularly enjoyed its slippery, almost weightless feel. One could read this as an early beginning of a practice that then continued to stay with her watery landscapes. Even though her choice of material may have shifted, water is an on-going presence in her works. 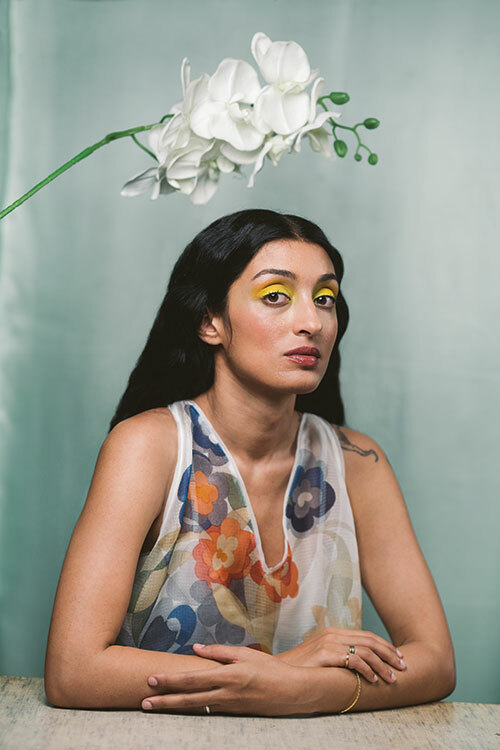 She studied art while in school in Mumbai, went on to pursue it as a university degree at college in the US, and later had the opportunity to work out the intricacies of her practice through interesting international residencies. While on one in a small town close to Lisbon in Portugal, the artist needed to visit the regional visa office to apply for a renewal. She asked a local friend to accompany her to the office to ensure that nothing would get lost in translation. After a quick interaction, where her friend spoke to an agent in Portuguese, the near impossible happened — the visa was extended by a whole year. She moved to shared accommodation soon after, where she met her future husband, and in a short while they thought of relocating to Barcelona. Their move started off as an experiment: the city was not as gentrified as it is now, and at that time it was comparatively more affordable to live and work there. This allowed her to pursue her dreams of having a studio space and working full-time on her practice. The two stuck it out, and gradually built a life in the city. 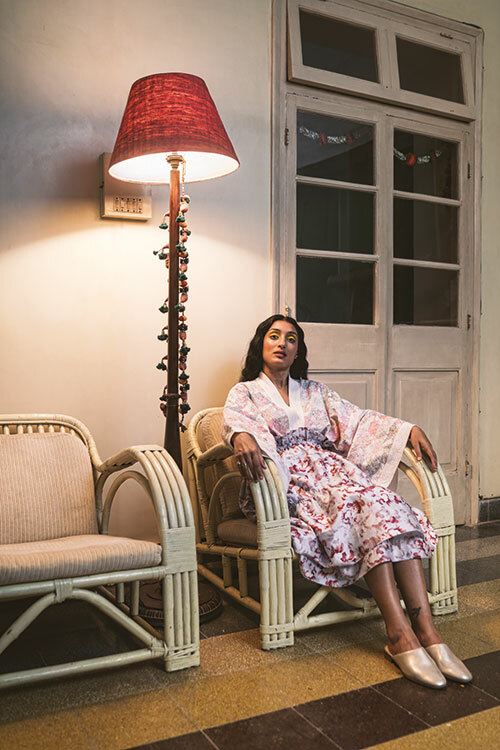 Embroidered cotton kimono, from Untitled Co.; taffeta skirt, from Hemant & Nandita, both in New Delhi. Metallic leather mules, from Clarks, Mumbai. Home for her, however, “is where my parents are,” she says. 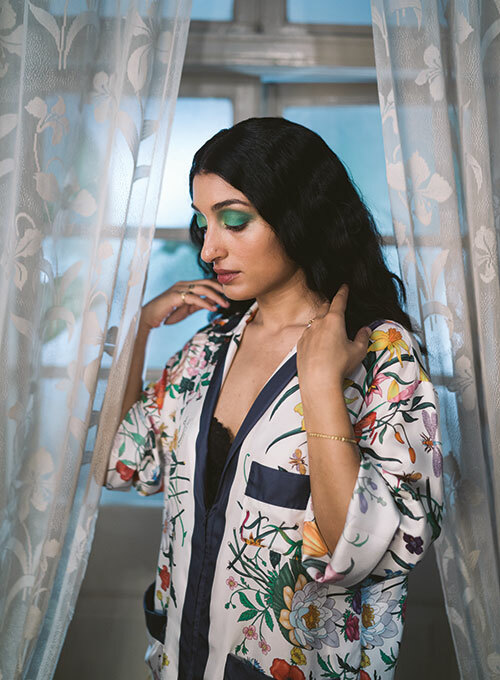 She returns to Mumbai often, because it is also where she feels that she has found a place for herself in the art scene. In Barcelona, it works differently, and although there are many interesting galleries and art spaces that she frequents, she has not yet found her own niche there. Silk maxi dress, from AM.IT by Amit Aggarwal, New Delhi. Merchant enjoys being close to her work, and since her early days in Barcelona, her studio has been in her flat. She likes being able to get up and dive straight in, and really live alongside the pieces as they develop. She’s not a very social person, preferring to remain in her studio and work long, uneven hours — “it all depends on when the mood strikes,” she says. Some days, she is up early, while on others, she is burning the night oil. In the summers, she will venture out in the evenings to take a swim in the sea, as she lives very close to it. In Lisbon, she started working on creations that took cues from the Portuguese style of mural making. It was the ideal manner in which to work: she found a small room, put a desk at the corner of it, and started sectioning off images onto paper tiles and moving them around or placing some to a side. By creating a grid for the work, she was able to play with a size much larger than the small space she occupied. She laughs as she recalls this early method, because even though she is no longer working on that scale, this is still the way in which she paints. Her work often bears the trace of this sectioning-off, and many pieces have a cartographic feel to them. She came back to Mumbai in early 2010 with this body of work in tow, and showed it to a friend who worked at Saffronart at the time, a friend who was in fact the only person she knew on the Mumbai art scene. He put Merchant in touch with different gallerists, trying to figure out what could be the best fit. She was then picked up by Gallery Art & Soul in Worli for a solo show, with a catalogue essay written by Clark House Initiative’s Sumesh Sharma. Hena Kapadia happened to visit the show; the two knew each other as they had gone to the same school. It was serendipitous timing for both, as Kapadia was in the process of founding Tarq. Still, things moved cautiously, and the two stayed in touch over the next year or so, slowly building a relationship. Flora silk twill shirt, from Gucci, Mumbai. Lace bra, Rithika’s own. She does not indulge in conversations that propose that the art scene is now more egalitarian, or more approachable and open, because the truth is that it is not. Art is still viewed and discussed by a very privileged section of the population. She continues, “Sure, you could walk into a gallery, look around and enjoy the work and not buy anything, but the fact that you know it’s a high-value object…it changes the viewer’s relationship with it.” She admits that using social media does allow her to expand and gain visibility, but it is not as though it radically changes the game. Silk maxi dress, from Rara Avis by Sonal Verma, New Delhi. She is overall quite suspicious about making too big a claim over what happens with the introduction of social media to the art scene. “I think I am a millennial, but perhaps an older one…. My relationship with technology is radically different to what people maybe 10 years younger than me have. I don’t need to project my identity online in the same way,” she elaborates. 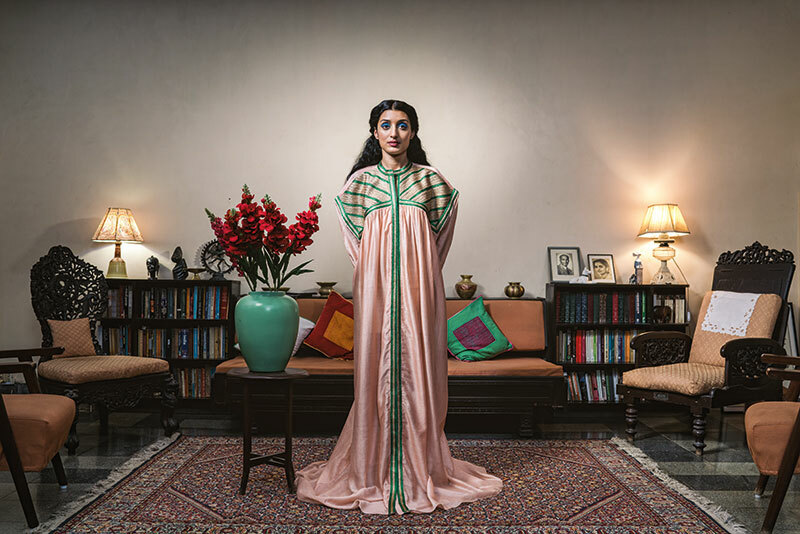 What Rithika Merchant represents is an artist on the cusp — critical of making any broad claims, and very steadfast in maintaining that what she knows best is her own practice. The contemporary moment calls for such nuances, as well as the ability to see things in clear perspective. An artist’s life may be a charmed one, but it is also a difficult and a precarious one at best.